Most sucker fish, or algae eaters, are tropical or semitropical fish from South America. They are not well-adapted to extremely cold water, which is the perfect environment for koi. A few varieties of sucker fish can survive mild winter weather changes, but none will withstand below-freezing temperatures. This means that typical sucker fish are ideal for outdoor ponds only during warm months. Hillstream loaches, many species of fish of the Balitoridae family, commonly serve as algae eaters, preferring fast-moving waters with temperatures of 68 to 75 degrees Fahrenheit. The weather loach (Misgurnus anguillicaudatus), also known as the dojo loach, the Oriental weather fish and the pond loach, can thrive in even cooler waters. The weather loach likes a temperature range of 40 degrees Fahrenheit to 77 degrees Fahrenheit, making him suited to mild winters. The fish reaches 10 inches and should be kept in small groups. With more than 700 plecos known and more being found regularly, it's tough to say which species would serve a koi pond best. The most commonly known are the bristlenose plecos, of the Ancistrus genus in the Loricariidae family. Ancistrus temminckii is the smallest of the plecostomus family, measuring a maximum of 5 inches. The albino bristlenose pleco is smaller, at a maximum of 4 inches. These fish eat algae and are comfortable in a range of 68 to 80 degrees Fahrenheit. They get along with other fish. Many types of fish eat algae occasionally, particularly string algae. Guppies are fond of string algae, but they don't do well in winter ponds. Goldfish and koi eat string algae as well, but they prefer other foods. These fish eat algae during the winter months when the pond is frozen. 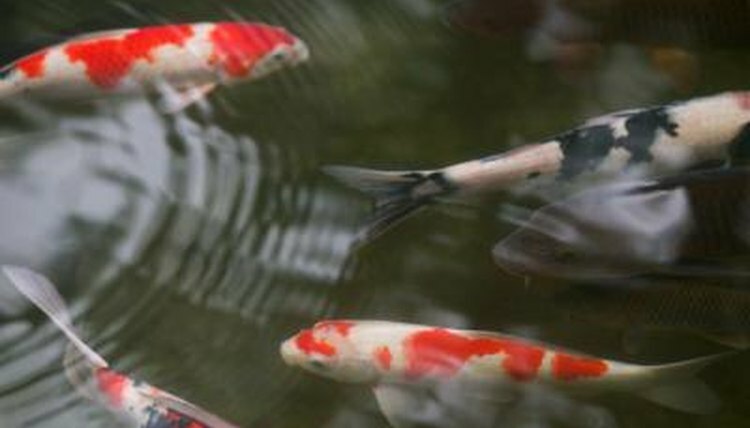 During that time, goldfish and koi won't eat flake or pellet foods but will nibble gradually at the algae. This is how the fish keep weight on through the winter. An alternative to sucker fish for outdoor ponds are trapdoor snails. These large, live-bearing snails eat algae and withstand freezing temperatures with ease. These snails also devour decaying fish food, fallen leaves and various other muck from the bottom and sides of the pond. These snails grow to around 3 inches long. Measure the area of the pond and figure one snail for 3 square feet of pond.